If you have been injured in a Rhode Island or Massachusetts car accident involving an electric vehicle such as a Toyota Prius, Tesla, or Chevy Volt, you may have important legal rights. 130 years ago today, July 27th, Philip W. Pratt took a joy ride around Winthrop Square in Boston on the first American electric tricycle. Created by Fred M. Kimball, this tricycle weighed about 300 pounds and could reach a top speed of 8 mph. In 1890, a six passenger vehicle was invented by William Morrison, a chemist in Des Moines, Iowa. According to the Department of Energy, electric cars accounted for around a third of all vehicles on the road by 1900. 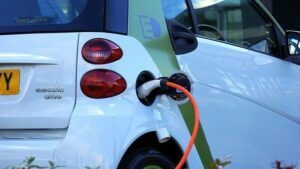 Act Amendment and the 1992 Energy Policy Act was passed that electric vehicles had a moment to make a comeback. Automakers were now making these electric vehicles more similar to their popular gasoline-powered vehicles, allowing them have a range of 60 miles. Nowadays, electric cars are becoming more and more popular. One of the most popular car brands, Tesla Motors, strictly produces electric sports cars. Electric cars cause personal injuries just like any other car on the road. Electric cars are subject to important laws and regulations. These include securing the batteries during an auto accident, and isolating the frame from the high-voltage system to prevent electric shock. These vehicles also have a lower center of gravity, making them less likely to get into a rollover accident but prone to other types of accidents such as catching on fire, and computer malfunctions that can cause different types of personal injuries for both the pedestrian and driver. At the Bottaro Law Firm, we investigate car accidents causing personal injuries, including caused by electric cars. There is important investigation and time deadlines to adhere to, so contacting us immediately after a car accident is important to preserve your legal rights. At the Bottaro Law Firm, we handle car accident personal injury every day. Honesty. Integrity. Results. Our experienced legal team is here to fight for your rights. Contact us in any method you prefer 24/7 for a fast, free, and confidential consultation about your case. Text or call: 401-777-7777 or fill out our free and confidential online form.